Product prices and availability are accurate as of 2019-04-23 05:31:36 UTC and are subject to change. Any price and availability information displayed on http://www.amazon.com/ at the time of purchase will apply to the purchase of this product. 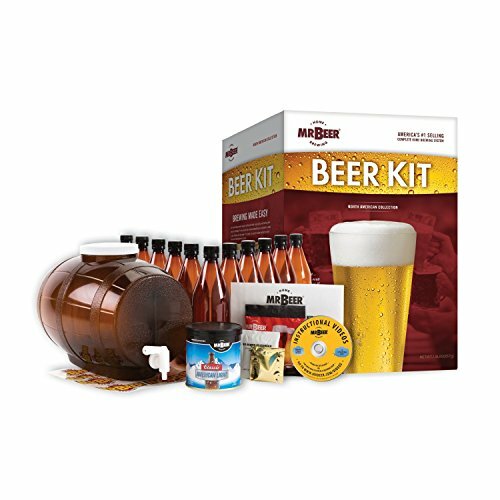 Mr. Beer North American Collection beer home brewing kit gives you everything you need to brew beer at home. With all the ingredients and supplies needed to brew and bottle 1 batch of quality home-brewed beer, this kit is a great gift for the beer lover in your family. The North American Collection Kit includes a brewing keg, North American style beer mix, bottles and labels, DVD & catalog with instructions, no-rinse cleaner and carbonation drops. Keg fermenter and bottles are lightweight, shatter resistant and completely reusable, thanks to their FDA-compliant plastic construction. Makes 2 gallons of great tasting beer in as little as 14 days.